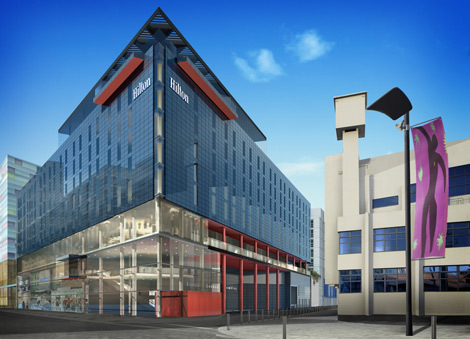 Hilton Worldwide is set to open its latest London hotel in time for the London 2012 Games, with a 361-room property located opposite Wembley Stadium. The group’s website says the Hilton London Wembley is now accepting reservations for stays from July 20. The hotel features 18 suites, a ballroom seating up to 660 delegates, ten meeting rooms, a business centre, an executive lounge, the ninth floor Sky Bar 9, The Association restaurant, a health club with 12-metre pool, sauna, steam room and gym, and 200 parking spaces. The area around Wembley Stadium is currently undergoing regeneration, with The London Designer Outlet – a 280,000 square foot retail space – also under construction next to the statdium. Wembley Stadium will host its first London 2012 matches on July 29 (including Great Britain men’s team vs the UAE), with the women’s and men’s gold medal matches being played on August 9 and 11 respectively. Tickets for selected matches are still available at tickets.london2012.com, and the Hilton London Wembley is showing availability on several match days. The new hotel is the latest opening for Hilton Worldwide in the London area. The group recently unveied a property close to Heathrow Terminal 5 (click here for a review), and new Hilton and Hampton by Hilton hotels are set to open on the South Bank and in Waterloo respectively (see online news July 5, 2011). The group also recently rebranded several Mint Hotel properties in London following the acquisition of the brand by Hilton’s owners Blackstone (see online news November 9, 2011), and the former Hesperia London Victoria was rebranded under the Doubletree by Hilton offering earlier this year (see online news March 5). Finally Hilton Worldwide opened its first London property under the luxury Waldorf Astoria brand last year, a 137-room hotel set in 80 hectares of parkland within the Grade I Listed Syon House estate (for a review click here). For more information visit hilton.co.uk.